“If slaughter houses had glass walls, we’d all be vegetarians” – Paul McCartney. As much as people would like to believe they know, a vast majority could probably only say which grocery store their meat came from, as opposed to how it was raised and treated. This editorial piece is one of an on going series that brings to light the horrific reality of the meat industry. 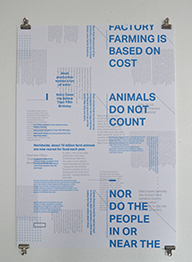 Exploring the idea of ‘hidden truth’ in the meat industry, it aims to convey a harsh subject matter in a light way through its design.